– Would you have been appeased if the wall had been smaller, or if we had written on the ground instead? How small and trodden on must our dreams become before they are acceptable, before they are no longer a threat to you? – Are you seriously happy doing the jobs you are paid for? Do you sometimes lie awake at night thinking that there must be better things you could be doing with your time? – And you, Morgan Andrews, do you still offer students $20 towards the printing costs of our words, out of your ‘sympathy towards student activism’, and also go on to be one of the major ‘informants’ against students? Do you have still have cash on offer at all, or have you spent all your money on milkshakes for the cops? 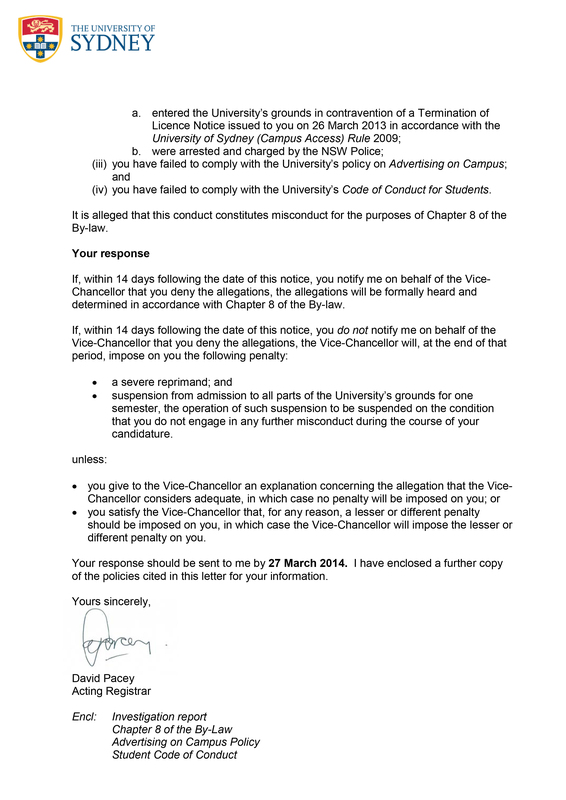 We are accused of “chalking on a large wall” in contravention of the Advertising on Campus policy. It surely must not be the act of writing in chalk for which you wish to reprimand us?Chalking is a daily event at Sydney University. It is practised often, and in plain sight. We can only assume that it was what we wrote which has turned this common action into ‘misconduct’: “Education is a process, not a commodity.” Perhaps we should have written “Education is a commodity, not a process”? Then we would have described the university as it is, not as we would like it to be. Perhaps this would have been more acceptable to you, but the university already engages in enough advertising commodifying education on campus. Advertising only allows some kinds of dreaming, the kinds of dreaming that commodify everything. We dream of education as a process driven by students, workers and the community. Apparently, stating this is going too far. We were all pushed and shoved by police. Some of us were slammed onto concrete and thrown down flights of stairs, some of us were tugged and punched and our bodies trampled, some of us were put in a headlock. Ribs were cracked, heads stomped on and legs broken. We know why we were attacked in this way. The police were called onto campus to harass and intimidate people supporting the picket. Student and community support of the strike expressed solidarity with workers demanding better work conditions. Better conditions were not conceded, and the political expression of the strikes continues to be shut down in different ways. Following this physical violence, some of us were arrested for invented misdemeanours, and some of us were banned from campus. We do not recognise the legitimacy of the bans or of any allegations of trespass that come as a result. These too are part of the continued repression of political acts. You hurt us, and you keep trying to hurt us in new ways. You have accused us of misconduct, but we accuse you. You banned students and other ‘members of the public’ from entering the university for political reasons, preventing them from carrying out their studies, and from participating in the cultural life of the university. You have changed employment conditions retroactively, unfairly and without consideration of your staff. You have cut over 100 staff, whilst student numbers are increasing and you have thrown away books from the libraries and threaten more job cuts there. Moreover, this year you have fired 40 ICT staff (which will only worsen the already abysmal internet and computer services). You continue to maintain vast numbers of staff in precarious positions on casual contracts. You collaborated with the police, offering them information, support, and encouragement, while they bashed and bullied us; you are complicit in our bruises and our trauma. This is bureaucratic violence and you practise it regularly against your staff and students. Who will hold you to account? It is clear that the security forces and police stand as one, that the university management and the state stand as one. You all defend the university, not as a space of learning, but instead as a space reproducing our enforced commodification. You dedicate resources to preparing students to sell themselves to the market to reproduce and maintain the world the way it is, instead of creating spaces for us to question the world. The same university that facilitated the brutality of police now represses us through the violence of legal and disciplinary threats, hanging over us, making it clear that resistance will be punished. This process emulates the political prosecution of the police in the courts of law. Both of these processes seek to intimidate us, and to waste our time. The charges you refer to were dropped in court, and here we find them again, familiar, spurious, deliberated on in a process even more arbitrary and secretive than the local court. The courts and this disciplinary process both seek to punish individuals for the collective action of many. They demand our submission. We refuse. We know that we did not endanger others on campus. We know our crimes were political. We know that the police were the real perpetrators of violence and fear on the days of the strike. We have chosen to collectively respond, but we will not follow the procedures set up to make sure that we end up overwhelmed and demotivated. Throughout this process, you have all worked together to justify your comfortable, but ultimately useless positions and your obscene salaries and bonuses. You have chosen to start and maintain the machinery of repression and persecution that singles out individuals, to try to make us feel alone in struggle, as punishment for standing up to the obsolete ideology that makes this university increasingly irrelevant to our lives.You requested that we respond in writing to your allegations and we do, only to challenge this spectacle of bureaucracy and your expectation of subservience. 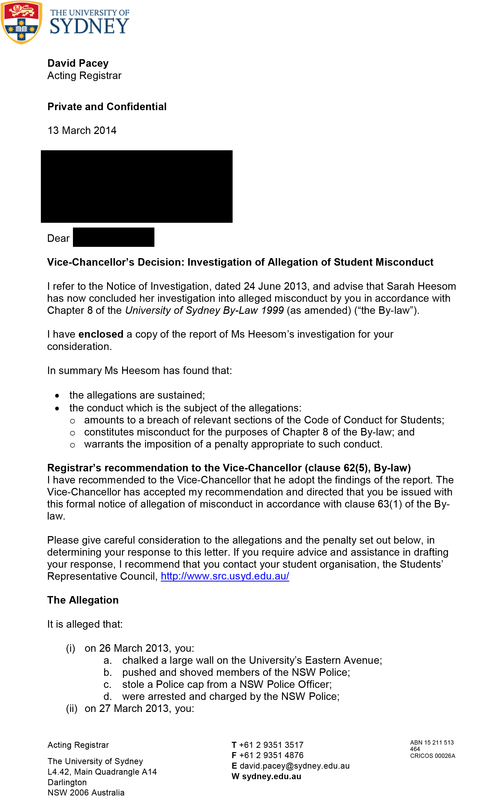 The University of Sydney is currently prosecuting a student for their involvement in the strikes last year. They do this despite the brutality of the police within those strikes and despite the emotional and physical toll already waged on staff and students for their participation. By prosecuting one of us, they hope to silence us all. A meeting has been called to discuss possible responses for this Friday (21/3) at 6pm at Victoria Park. I don’t know how many student rallies I’ve been to over the last 12 months, but it feels like an awful lot. After a while, they’ve all merged together in my mind into one overall student rally blur. I guess it’s not hard for this to happen. With minor variations, it’s the same thing every time: same march route, same chants, same placards, same speeches. The same number of about 300 marchers turns out every time and, increasingly, these 300-odd marchers seem to be exactly the same people every time, too. Cops off campus, cops out of our lives… Syd – UK – everywhere. Syd – UK – everywhere. 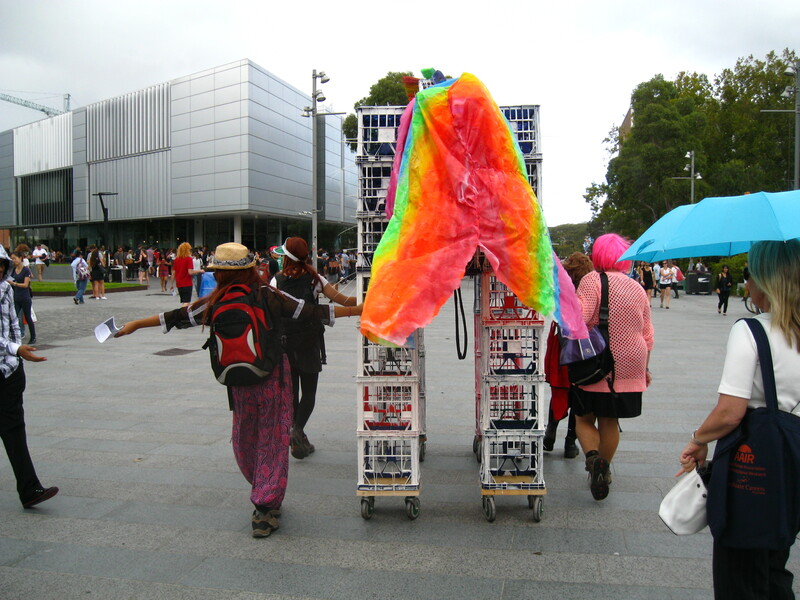 In a continuation of the struggles that have occurred at Sydney University in 2013, some workers dropped a banner from the busy Parramatta Rd footbridge declaring ‘COPS OFF CAMPUS, COPS OUT OF OUR LIVES’. The timing of this action is in solidarity with those in the UK who today will take action against the brutality of the police – management’s attack dogs – who have sought to crush the actions of workers and students fighting against the university’s increasing role in ensuring the precarity of all our lives. Faced with such hostility, management turned to their friends in blue. Many arrests, ongoing court cases and harassment, and a broken leg for one picketer were the result. We have also overall seen a generalised increase in police presence on campus, sending a message that they are there ready to have management’s back. We take this action in solidarity with those struggling in the UK and as a small first step in forcing cops off campus and out of our lives. Love and solidarity from Sydney. We join our voices in calling for the respect of people’s integrity and for a liberatory education. 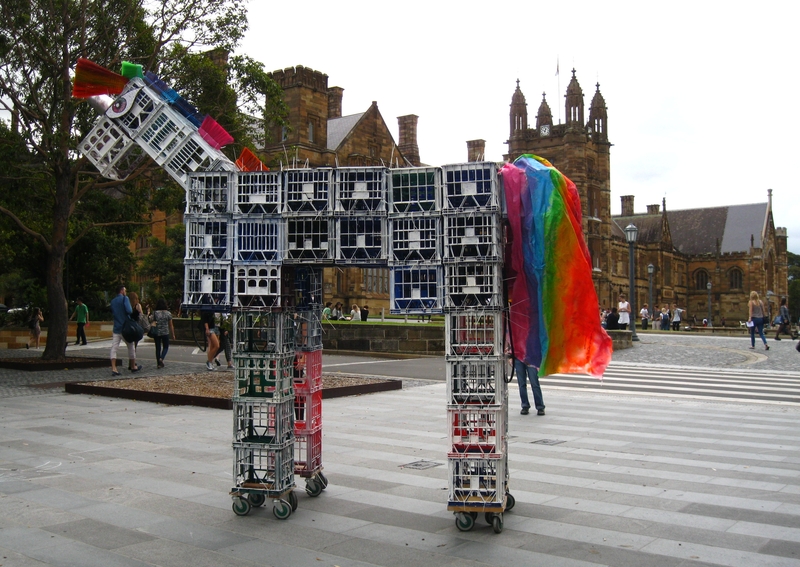 The industrial dispute at the University of Sydney currently represents one of the key conflicts involving higher education and the education economy more broadly in Australia. The acuteness of the antagonism at USyd is growing increasingly sharp. Over the past 24 months university management have made a series of decisions that have made university workers angry and lose trust. For example the handling of the library restructures since early 2011, the announcement of 350 job cuts across general and academic staff in late 2011 – early 2012, and most recently the approach to the enterprise agreement has created sharp antagonism leading into the bargaining of the enterprise agreement. A recent survey conducted by the university shows that more than 75% of respondents have no faith in the university management. [i] All of this represents good reason to be pissed off, and demonstrates its actuality. Yet it would be a mistake to think that all this anger is simply funnelled through the enterprise agreement, or that reaching even a favourable agreement will be able to resolve this anger. Whilst the dispute now is ostensibly focussed on the details of the enterprise agreement, beneath these formal dimensions there is a submerged world of the daily politics of work that is in fact the key terrain animating the antagonism.